Since 1996 the team base has been located oﬀ the Theatre by the Lake car park near the Borrowdale road. The base was purpose built to store all the necessary equipment, support rescues and provide space for training. We have now outgrown that space and a new extension is planned for 2019, watch this space. 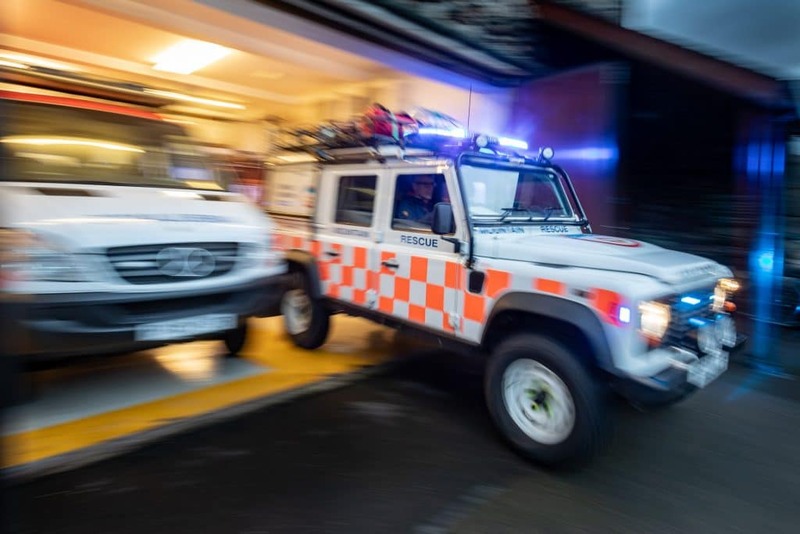 We have five vehicles prepared and ready at all times to respond depending on the requirements of a callout. 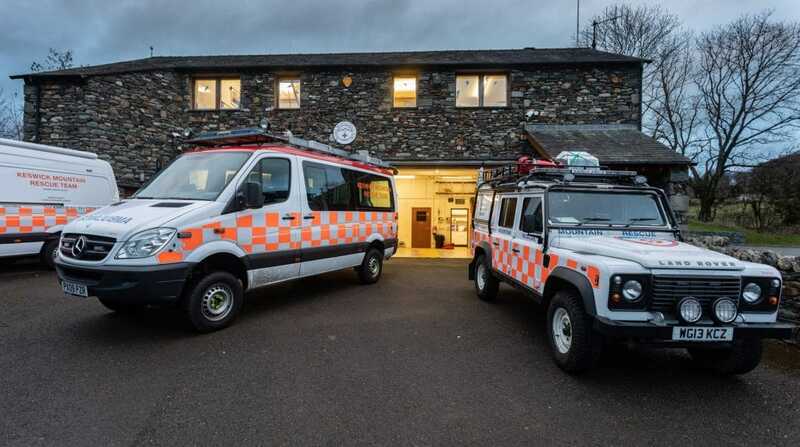 Two long wheelbase Landrover Defenders are equipped for general mountain rescue along with two 4 x 4 Mercedes Sprinters with more equipment but mostly dedicated to personnel transportation. 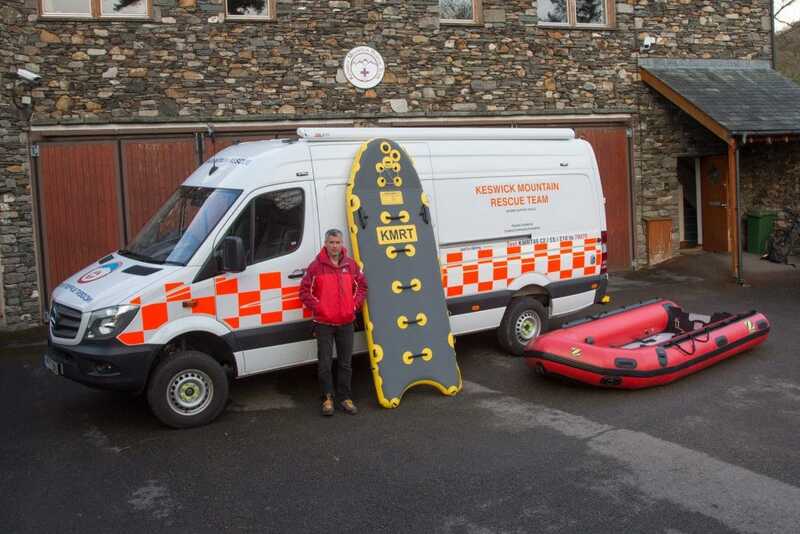 A third Sprinter is our dedicated water and ﬂood response vehicle with an already inﬂated boat inside that can be deployed quickly if needed. Bravo is our dedicated water and ﬂood response vehicle. Newly purchased and ﬁtted in 2018 it’s main advantage is that it can house a fully inﬂated RIB that can be deployed quickly. The vehicle is equipped with an eﬀective heater and facilities for decontamination. Keswick Team is proud of its standards of driving, both on and oﬀ road. It may well appear to onlookers to be loud at times, but in fact emergency responses are only to the most life threatening of situations. The excellent training we have received from ex-police driving instructors enables us to get to our access points to the hill swiftly and safely. 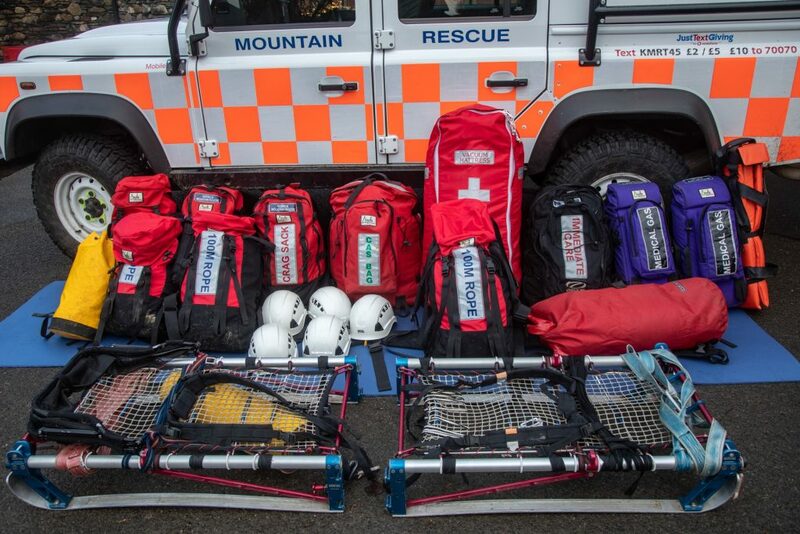 This photo shows most of the standard equipment carried by the Landrovers. 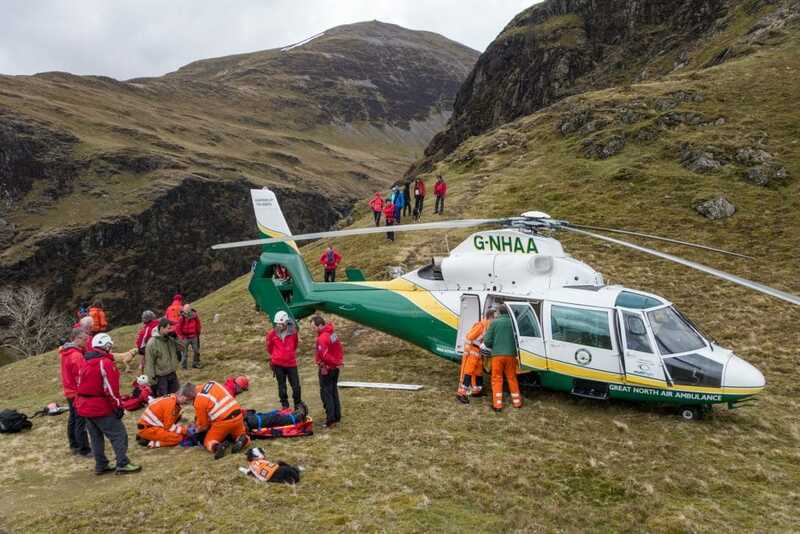 From medical kit to crag rescue and technical rigging equipment, stretcher, ropes and spare clothing, all equipment is checked at each weekly practice session. All team members are trained in advanced ﬁrst aid as a minimum with most having what is known as a Casualty Care qualiﬁcation. 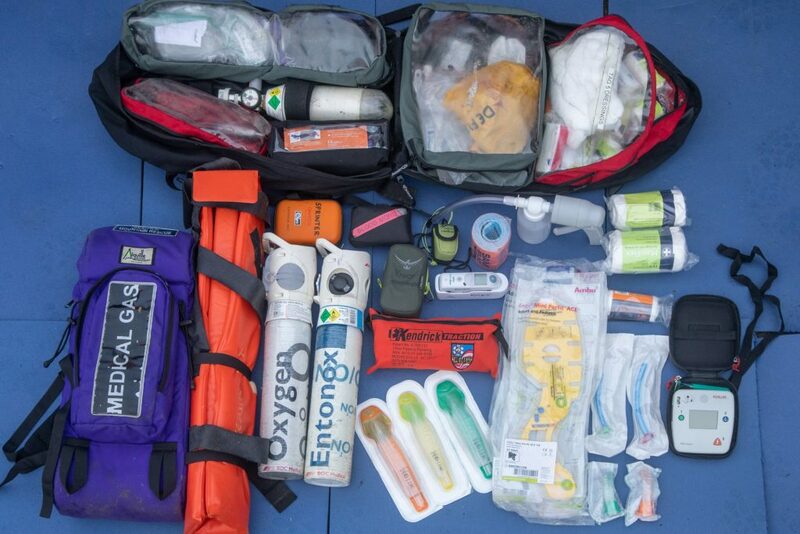 This photo shows some of the ﬁrst aid and life-saving equipment we carry and which team members must be familiar with in order to deal with the multitude of possible medical or trauma scenarios that can be encountered. It is important to keep a casualty warm and comfortable. 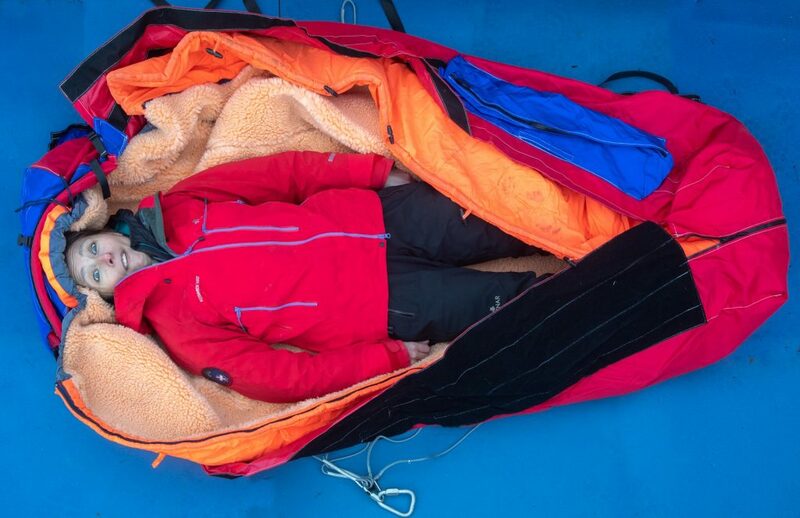 In this photo a team member is lying inside a casualty bag, essentially a waterproof thick ﬂeece sleeping bag. If the casualty had serious injuries and needed to be immobilised we can use a vacuum mattress which is an air mattress ﬁlled with beads that can be formed around the patient. When air is pumped out of the vacuum mattress it becomes rigid to hold the patient in a comfortable position and to prevent further injury. The Tyromont Stretcher on the outside is a ﬂexible winchable stretcher that also has handles for carrying short distances, a normal rigid stretcher would be used for longer carries. Our local air ambulance, the Great North Air Ambulance, based in Penrith is just a few minutes flying time from most of our area. We are also sometimes helped by the North West Air Ambulance based in Blackpool. Without a winching capability these helicopters have to land to load a patient. A paramedic is always on the crew which means that medical expertise with advanced pre-hospital techniques can normally be brought quickly to the scene. These large, powerful and high tech helicopters replaced the iconic yellow RAF Sea King’s in the UK’s mountain rescue arena. 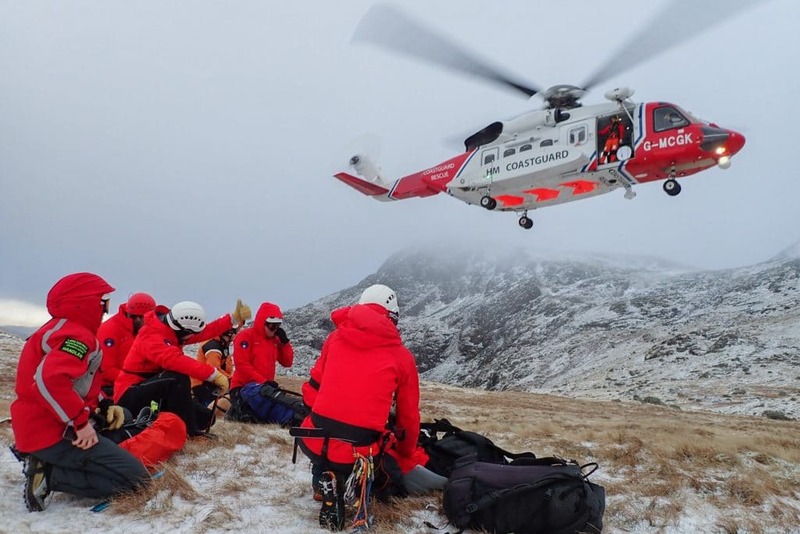 Capable of flying in a wide range of conditions and with a large load capacity and winch facility they can be a very welcome sight on many mountain rescues.